Address: 136 Golden Gate Pt. 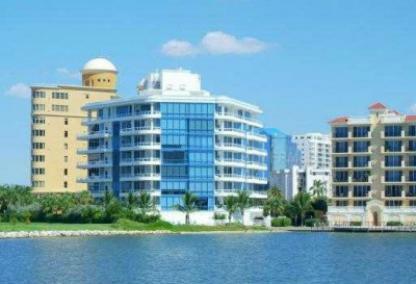 One of Sarasota's contemporary designed condos, the Phoenix was built to utilize the views of Sarasota Bay with expansive use of floor-to-ceiling windows. Conveniently located adjacent to downtown on prestigious Golden Gate Point, residents of the Phoenix enjoy all the nearby cultural offerings, beaches, shopping and dining. In addition, the art galleries on Palm Avenue and Main Street in Sarasota are just across US 41. Built in 2001, the Phoenix houses 12 luxurious condo residences and one fabulous penthouse. Residences are 3,785 square feet each while the penthouse is 5,540 square feet.